Places booked up for this visit within just a couple of days, filled by CBA London members and resulting in an overspill waiting list. It was good to see some members who hadn’t been along to visits before, and, as interest was so high, we intend to run the event again later in the year. We were able to put the new galleries in context as we proceeded around Westminster Abbey’s cloisters – first looking at some of the oldest surviving bits of the original Benedictine monastery, dating back to Edward the Confessor in 1065. The Abbey’s museum used to be housed in cramped conditions in the undercroft along the dark passage leading from the south east corner of the cloisters. The undercroft was the area under the dorter – the dormitory accommodation for the monks – and the only place where they had heating. The Pyx Chamber, a section of the undercroft which has served many purposes over its lifetime, retains the medieval vaulting and floor tiles. Next, along the east side of the cloisters, a vestibule contains the oldest door in Britain, dendrochronologically dated to c. 1050, and leads up some stairs to the Chapter House. Part of the second major building programme for the Abbey, it is the work of Henry III, who added a Lady Chapel to the Confessor’s church, and began rebuilding the Abbey in the style of the new gothic cathedrals in France, at Chartres, Amiens and Rouen. The Chapter House, built to serve as the daily gathering place for the 30 to 60 monks of Westminster for almost 500 years, eventually had a variety of other functions over its lifetime: as the Parliamentary chamber, for instance, and as the national archives. It was cleared of documents in the Victorian period and restored and refurbished by George Gilbert Scott. Fortunately, Scott retained the original medieval wall paintings and floor tiles, although he did replace windows and some stonework. Leaving the cloisters at the north east corner, we crossed Poets’ Corner in the Abbey’s south transept to reach the new Weston Tower – the first new structure to be added to the Abbey since Hawksmoor’s west front in 1745. Here Peter Moore, Director of Pre-Construct Archaeology described the archaeological works that had preceded the new building works. A section of the excavation has been left exposed in the foyer of the tower, showing the construction of the south transept of Henry III’s rebuilding of the church in the 13th century, using a vast stone raft to stabilise the foundation. Outside, in Poets’ Corner Yard, Peter described the archaeological discoveries, from prehistoric flints, through Roman building materials, to various medieval phases of construction of the Henry III ambulatory and Lady Chapel, and the Henry VII Lady Chapel that replaced it. At the edges of the monastic burial ground, the site also yielded a number of medieval and slightly later burials, including rare examples of decorated lead coffins in anthropomorphic form, with a rounded extension to contain the head. One stone coffin had been reused as part of the foundations of the Lady Chapel: this was excavated as part of the archaeological works and retained on display in the tower foyer. Also seen during excavations were brick foundations of some of the commercial properties that had been constructed against the south wall of the Henry VII Lady Chapel. Lessees of shops and houses along that wall had included Geoffrey Chaucer and William Caxton. Peter also described the most unexpected and spectacular finds from the project: those discovered under the floorboards of the triforium itself. As the space had been used only for storage and occasional seating for coronations and royal funerals, the amount of material found between vaults of chapels below and floorboards installed by Christopher Wren was a complete surprise. Some 3,500 building material bags of dust and other materials was extracted, to be sifted and sorted by PCA’s conservators. The items retained included pottery, glass, clay pipes, animal bones, human bones, shoes, tools and – most surprising perhaps – paper and parchment fragments ranging from 17th century tobacco wrappers and [possibly] 16th century playing cards, to medieval letters and handwritten coronation tickets, all preserved thanks to the dry conditions. In addition, three lancet windows, retaining most of their glass panels were extracted, along with some 30,000 fragments of coloured and/or painted glass. Two composite windows containing a selection of these fragments had been inserted into the walls of the bridge between the new access tower and the triforium galleries. CBA London’s visitors, it’s fair to say, were enchanted by these eclectic and very beautiful new creations. The Weston Tower, which provides access to the new triforium galleries is a work of art in its own right. Designed by the Abbey’s Surveyor of the Fabric (ie Architect) Ptolemy Dean, the standard of finish is exceptional, and it is designed so that each of the 108 steps offers a new perspective. In addition, the lift shaft around which the stairs wind, is faced with bands of stone representing all 17 varieties used in the past 1000 years in the construction of Westminster Abbey. The ascent provides previously rare views of the construction of both the 13th century Chapter House to the south and ambulatory chapels to the north. The first impression of most seeing the triforium space for the first time seemed to be overwhelming delight. The layout is spacious, and the medieval construction and 17th century re-roofing features are very much part of the experience. Displays in the Queen’s Diamond Jubilee Galleries are set out in four thematic sections, but it is very much a space to explore, to circle round and rediscover. Distinctive views from the galleries over other parts of the Abbey – such as the Confessor’s shrine, the Cosmati pavement in front of the High Altar, Poets’ Corner and the Muniment [ie records] Room – provide glimpses of yet more history, architecture and archaeological heritage. And externally, surprising perspectives appear – of Parliament, St Margaret’s Church, Parliament Square, the rooftops of the Henry VII Lady Chapel and beyond. There are so many ‘oldest’, ‘earliest’, ‘best preserved’, ‘only’, ‘largest’ or ‘finest’ artefacts displayed it is almost unthinkable to single any out, but these four objects give something of a flavour: The Westminster Retable – oldest surviving altarpiece in Britain; the Litlyington Missal – containing the earliest known coronation services; the little medieval tapestry seal bag embroidered with three lions – the only known example; the funeral effigy of Henry VII – carved from his death mask and said to reflect the character of the creator of the new Tudor dynasty. This entry was posted in Uncategorized on March 1, 2019 by cbalondon. Last month, CBA London members were given the opportunity to visit Bevis Marks Synagogue; the oldest synagogue in continuous use the UK. Due to past laws prohibiting the Jewish people building on public thoroughfares, the building cannot be seen at all from Bevis Marks. The only indicator of its presence is an entrance sign (written in Hebrew) above a brick archway built into the surrounding office building. Upon entering the iron gates just beyond the brick arch, we were able to see the building itself for the first time. The fairly unassuming appearance of the red brick exterior made the reveal of the stunning interior all the more impressive. The first half of the visit consisted of a lecture by the synagogue’s curator, Maurice Bitton, about the history of Judaism in the UK, how Bevis Marks Synagogue came to be built, some notable historic members of the congregation, and the Jewish community at Bevis Marks today. Jewish people were first brought to the UK by William the Conqueror in 1070 to work as bankers/money lenders, as the Catholic Normans did not deal directly with money. After facing much anti-Semitism for over two centuries, the Jews were expelled from Britain by Edward I in 1290. They did not return to Britain until after the Civil War, when Sephardi Jews living in Amsterdam arranged a meeting with Oliver Cromwell. Cromwell agreed to let Jewish people return to Britain, and after arriving in 1656 they settled in the Bevis Marks area. Their first place of worship, on Creechurch Lane, was just a room in a house. The foundations of the Bevis Marks Synagogue were laid in 1699 by Joseph Avis (which was around the time much of East London was rebuilt after the Great Fire) and it was completed in 1701. The main inspiration for the synagogue’s design was the Portuguese Synagogue in Amsterdam, where the original worshippers came from. Although the layout is similar – the Bevis Marks synagogue is half the size. As the synagogue was situated near a large number of churches, it was specifically designed to blend in and keep a low profile. It is the only place of worship in London from this period with the interior still intact. The wooden benches have rarely been repaired since the opening of the synagogue, and some wooden benches from the Creechurch Lane room predating the synagogue still remain. The seven chandeliers were given as gifts from Amsterdam, representing the seven days of the week (with the largest chandelier representing the Sabbath). The Holy Arc, where the scrolls of the Torah are kept, has wooden carvings typical of the period (similar to those in churches of the same period), and the Ten Commandments written at the top. It is placed against the east wall, so when worshippers face it, they also face Jerusalem. The twelve columns supporting the gallery represent the twelve tribes of Israel. The only major addition to the building since its completion is the choir stall – in roughly 1800. This was due to an increasingly anglicised community wishing to have sung melodies during services. It is still used in services today, to lead chants and for the addition of different melodies. Some notable congregation members include 19th century philanthropist Sir Moses Montefiore; still a legendary figure among London’s Jewish community. His 100th birthday (24 October 1884) was declared a Jewish holiday, with a much celebration at Bevis Marks Synagogue on the day. His seat at the synagogue is now cordoned off, and reserved for special guests only. Another notable member was Benjamin Disraeli, a former Prime Minister of the United Kingdom. Although his family was converted to Christianity after his father fell out with the synagogue, he was proud of his Jewish heritage, and was faced with anti-Semitism throughout his career. For the second half of the visit, the visitors were given the opportunity to look around the synagogue, and look at some of the items on display. On the ground floor, these included the Lord Mayors’ Silver Cup, the Montefiore Silver Xiddish Cup and an 18th century silver pointer. Upstairs in the gallery there were several Torah mantles dating from the 18th and 19th century. On the walls surrounding the gallery there were several wooden plaques listing “Gentlemen who have served (or fined) the offices of Parnassim or Gabay Commencing of Rosh Ashana”, dating from the opening of the synagogue up to the present day. To learn more about Bevis Marks Synagogue, visit their website. To become a CBA London member, follow this link. This entry was posted in Uncategorized on February 9, 2019 by cbalondon. On Saturday 1st December 2018, CBA London trustee Rob Whytehead led a fascinating walk around Clerkenwell. After the group met outside a local pub, the first point of call was the Clerks’ Well; a feature dating back to the 1500s that gave Clerkenwell its name. We then walked back up Clerkenwell Green and around to the modern entrance to St James’ Church, which has been a parish church since 1176. Excavations and the examination of historic maps have provided insight into the floor plan of the church, and locations of features such as the cloister, gatehouse, kitchen and nun’s hall. An Iron Age ditch had also been excavated just across the road from the church, possibly indicating a fort or other man-made structure. The only remnants of the cloister at St James’ are the church garden, and the original cloister wall still visible underneath the more modern church boundary walls. After a walk around the immediate area surrounding the church (which had previously contained buildings such as prison, workhouses, factories and workshops), we walked down to Clerkenwell Green; a road famous for its political activism. Over the years this has included protests, demonstrations, and the founding of the Marx Memorial Library & Workers’ School in the 1930s. The next port of call was the Priory Church of the order of St John, where the group took shelter from the rain underneath the gatehouse!. The original building had been destroyed after the dissolution, but the original curved wall of the nave is still marked on the pavement today. We then walked around the gate of the inner precinct, taking note of the former clockmakers building on St John’s name and the many plaques of clockmakers that worked in the area from the 17th century onwards. The last location we travelled to was the Charterhouse Square. Several human bodies have been excavated here, that had been buried in the 14th century after the outbreak of the black death. The Charterhouse, built in 1371, was once home to a strict order of Carthusian monks. It is now a museum, which you can learn more about here. The walk ended at the entrance of the Queen Mary University of London Charterhouse Square campus. 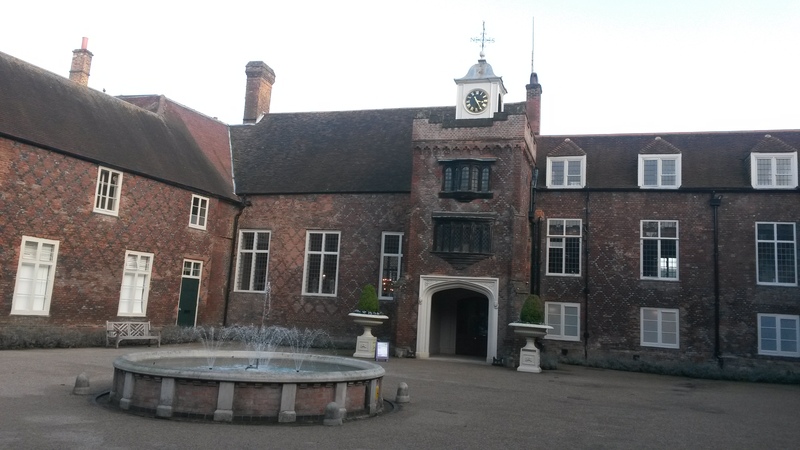 Several of the buildings now owned by the university were also once part of the original Charterhouse. If you are interested in attending CBA London events in the future including fascinating walks and tours, be sure to check the events section of our site, and our Eventbrite page. This entry was posted in Uncategorized on December 19, 2018 by cbalondon. Tucked almost completely out of sight behind a modern parade of shops on London’s Fleet Street is St Bride’s Church; one of London’s most historic churches, with worship possibly dating back to the 7th century. On the 31st October 2018 CBA London had the privilege of being shown around the crypt at St Bride’s by Jelena Bekvalac, Osteoarchaeologist at the Museum of London’s Centre for Human Bioarchaeology. The evening started with an introduction to the church’s history. After burning down in the Great Fire of London, the church was rebuilt by famous architect Christopher Wren. The distinctive spire is said to be Thomas Rich’s inspiration for the first tiered wedding cake in 1703. Unfortunately, the church was destroyed once again nearly 300 years later during the Blitz. However, this uncovered several previously unseen archaeological features, and excavations from the 1950s onwards have led to the discovery of 227 human burials (213 adult, 14 sub-adult). As some of the coffin plates from these burials were found to be still intact, the name and age at death for many of the individuals is known. This is useful not only to confirm the identity of these individuals, but also for osteoarchaeologists to test the accuracy their skeletal aging methods. Another advantage of the presence of these burial plates is that the names and dates can be searched in other records (e.g. birth/death/marriage certificates, company records) to provide context and background for the individual’s life. Following this short introduction we entered the church, and ventured down a floor to the entrance of the crypt, where an iron coffin was on display. This is one of two that have been excavated at St Bride’s, which were originally used to prevent body theft commonplace in the 17th and 18th centuries. We were then taken through the Wren Study Centre, where there are displays showing many of the finds from excavations at St Brides and the remains of the medieval chapel at one end, and into the crypt itself. Inside the crypt is a medieval charnel house; a sort of macabre storage area for bones dug up from the churchyard to allow room for newer burials. Stacks of hundreds of disarticulated bones covered the floor of this charnel house. The tour concluded in a room stacked to the ceiling on each wall with skeleton boxes, and leaning against the wall in one corner were coffin plates that had been excavated; the inscriptions still clearly visible. A small selection of skulls were placed out onto a long table, with a large variety of features including blunt force trauma, trepanation, cancerous lesions, metastatic bone, and even a skull sliced across horizontally (evident of a post mortem). Some interesting dental features were also present, including a gold filling and a gold wire. CBA London strongly recommends a visit to St Brides, whether you are a local history enthusiast or just someone looking for an interesting day out. Click here to visit the official website, where you can read details of the guided tours held there. CBA London would also like to thank Jelena Bekvalac for providing a fascinating tour of the crypt. Her full list of publications can be found here. This entry was posted in Uncategorized on November 16, 2018 by cbalondon. On Wednesday 11th July 2018, Eliott Wragg of the Thames Discovery Programme led this walk along the Rotherhithe and Bermondsey stretch of the river. Several large timber structures created from Napoleonic era warships lie along the foreshore, as well as whale bone reused as structural elements. Damaged caused by the Blitz was evident in the architectural features of the former warehouses overlooking the Thames, where entire sections had been destroyed and rebuilt. Having now been converted to modern flats, the residents could be heard celebrating after England’s first (and only) goal of the World Cup semi-final! We then had a quick stop at the Manor House of King Edward III; built in the 1300s, and now with only the remains of the walls and moat left. The evening was rounded off with a trip to The Ship Rotherhithe for a drink, and for football fans; the second half of the semi-final. To learn more about the Thames Discovery Programme visit their website. This entry was posted in Uncategorized on September 9, 2018 by cbalondon. 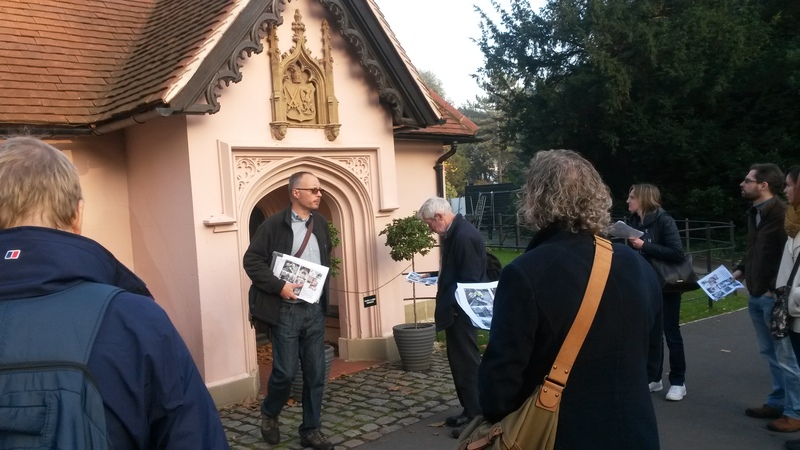 CBA London trustee Rob Whytehead led a sell-out visit to Rotherhithe on 12 December, where we got a taste of the archaeology and history of this one time village on the Thames. At Edward III’s moated manor house, Rob described theories on why the manor was built, its history and the archaeology that has revealed its development from 14th to 17th centuries. We examined the significance of the river and the important shipbuilding and shipbreaking industries that thrived here, and the work of Thames Discovery Programme FROG members in recording what remains. In Rotherhithe village we popped into St Mary’s church, an attractive Georgian church where the captain and crew of the Mayflower are buried, and had a look at other early buildings that remarkably survived the blitz. Our final port of call was the Brunel pump house museum, where we were treated to a fascinating guided tour by local resident, actor and volunteer Tim Taylor (he was the doctor attending the dying Simon Callow in Four Weddings and wrote and performed the theme music for Rainbow…). By the time they had crawled through a short metre high tunnel and down scaffolding stairs to the huge chamber of the vertical excavation shaft, the group fully appreciated the revolutionary techniques of the undertaking of building a sub Thames tunnel. The vision and daring of Marc Brunel (father of Isambard, who also worked on the project) resulted in the first tunnel under a river anywhere in the world, in a project that took from 1825 to 1843 to complete. And afterwards, a large contingent of CBA London members naturally headed for the excellent Mayflower, for a pint of Scurvy (yes, really). Members had some great ideas for future visits, which we’ll follow up in the new year. This entry was posted in Uncategorized on January 19, 2016 by cbalondon.